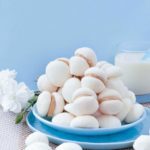 Aquafaba meringue cookies – What’s Aquafaba ? Aquafaba also called bean liquid or chickpea brine is the liquid in which canned chickpeas are preserved. I think that most of us discard this precious liquid. But please STOP! The first time I saw a video on youtube about using bean liquid as a egg replacement – I have to say I was both – excited but doubtful. So I decided to try myself. 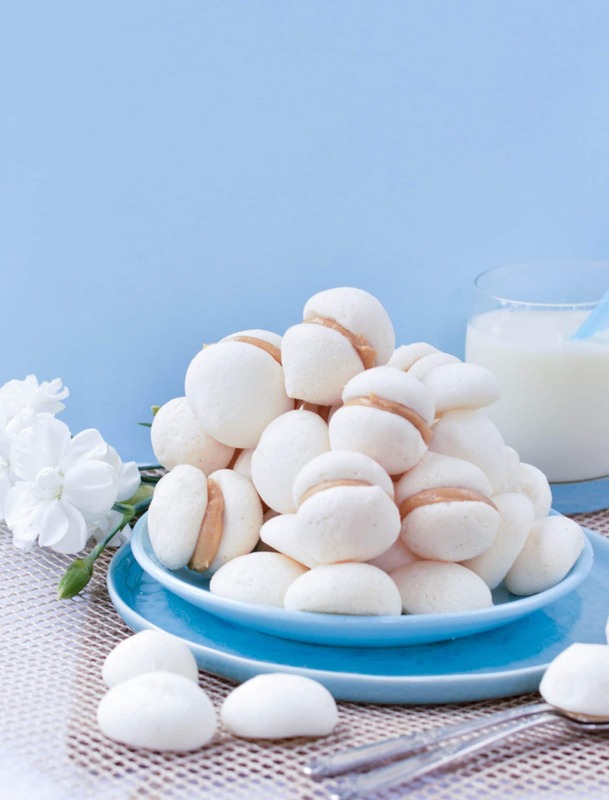 A aquafaba meringue cookies recipe without eggs using chickpea brine or the magic liquid called aquafaba. I started to whisk the liquid in my stand mixer, adding sugar gradually as I will actually do for a regular French meringue recipe. After only 3 minutes it absolutely looked as a meringue with egg white. Since then I also did a aquafaba chocolate mousse recipe that taste amazing ! This chickpea brine liquid is simply the best thing I discovered lately! How does this taste ? Well it is tasteless, no bean flavor at all. I choose to make my aquafaba meringue cookies a little bit special. I stick them together using a simple peanut butter frosting. Look at those cute meringue ! So tasty with a glass of almond milk. 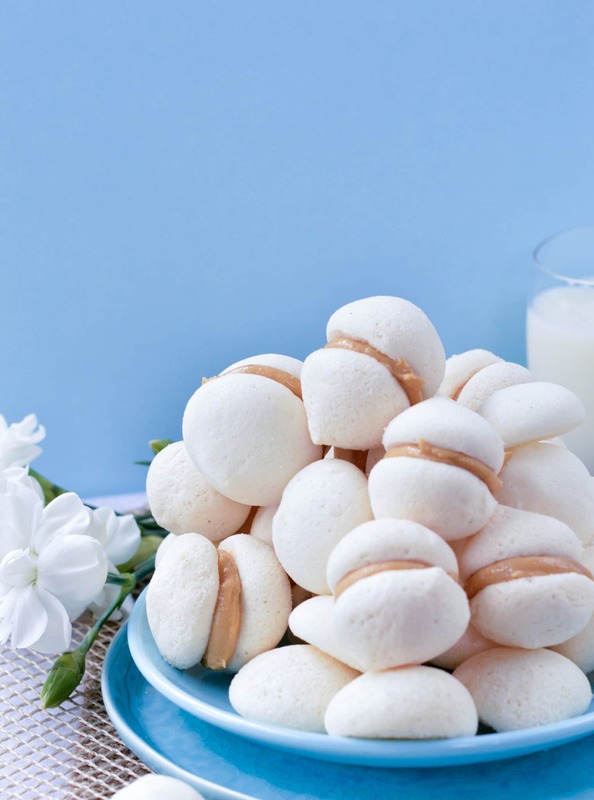 This recipe makes about 50 small aquafaba meringue cookies – so 25 peanut butter aquafaba meringue cookies. Aquafaba meringue cookies are delicious vegan meringue kisses made of chickpeas brine and stuffed with peanut butter. Preheat oven to 250F (120 C). Open the chickpea can and drain the chickpeas keeping the chickpea liquid into a bowl. Pour the chickpea liquid, vanilla and cream of tartar into your stand mixer bowl. Whisk on high speed for 30 seconds - it should starts to get foamy and whiter- keep whisking on high and now add the sugar gradually - about 1/4 cup at a time, not all at once, sprinkle the sugar - repeat until all the sugar has been incorporated and a stiff pick form. It took between 3-5 minutes. It very depends on the speed of your stand mixer it may took a bit longer if you are using an electric whisker. When a stiff peak form, stop the stand mixer. Transfer the mixture into a pipping bag and form small meringue on the prepared baking sheet. Bake for 1 hour to 1 hour 30 minutes or until the meringue has harden. Cool down on the baking tray while you prepare the peanut butter filling. In a bowl, combine the peanut butter and liquid sweetener. Microwave for 30 seconds, give a good stir to incorporate and transfer into a pipping bag. Pip small dollops of peanut butter filling on the flat side of the meringue then stick another meringue on the top. 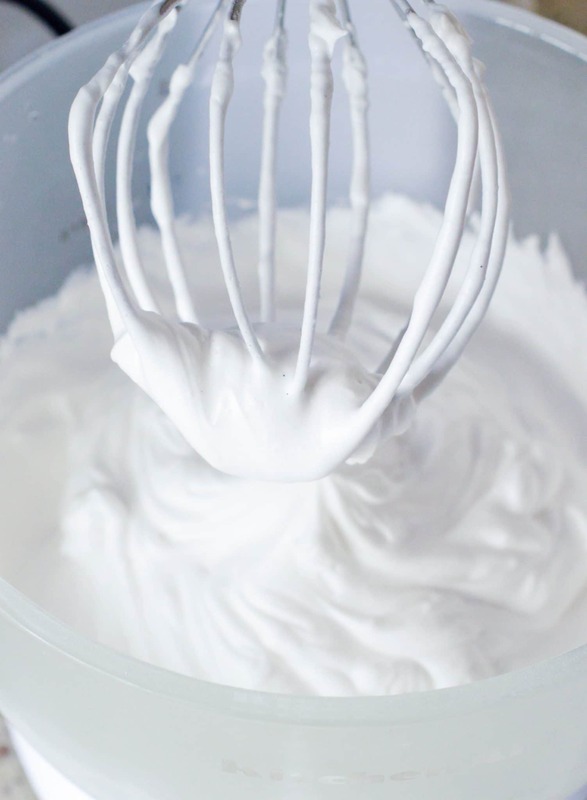 Do no press to avoid breaking the meringue but instead rotate them on the opposite side to stick while spreading the filling evenly in the center. Store the meringue in a cookie jar for up to 5 days. The meringue are getting softer when they stay at room temperature so don't prepare them too early. Nutrition panel is for one aquafaba meringue cookie with peanut butter. It means two meringues cookies kisses stick with peanut butter frosting. I am SO keen to try this as it makes no sense to me but looks so good! Thanks for this wonderful recipe! I’m a vegetarian, so looking forward to trying this out. Quick question — at what temperature did you bake them? I’ve tried a similar recipe in the past, with a product called Versawhip which also foams up. However, I didn’t have any luck with that. The macarons would deflate and turn into a complete puddle that bubbled up when baked! I’m hoping for better luck with this alternative! Thank you soo much for this recipe I tried it using powdered sugar and 1/8th of a teaspoon of cream of tartar. it was absolutely marvelous!!!! My vegan freind loved it. I baked 3/4 of the meringue , the rest I added pure cocoa powder then whipped it up a bit more and served it as a dip to go with the meringue and it was a huge hit. So if using sugar I suggest adding the cream of tartar. I placed the chickpea water with the vanilla extract and whisked until light in color and frothy, then I added the cream of tartar powder and whisked on high until very white and fluffy. Only after that did I dare to add the sugar in three batches whisking after each addition for no less than 3-4 minutes. As I always do egg based meringues. 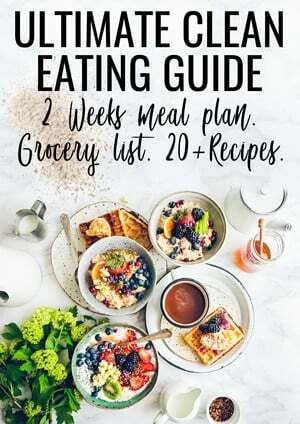 So when it goes gooey its because you may have added the sugar too quickly and not allowed it to be completely incorporated before adding the next part of the sugar. or if you added it all at once. when you first add the sugar the meringue becomes dull, then once its well incorporated it becomes glossy again thats when you know you can add the next portion of sugar. Hi Basma, thank you so much for sharing your experience here! 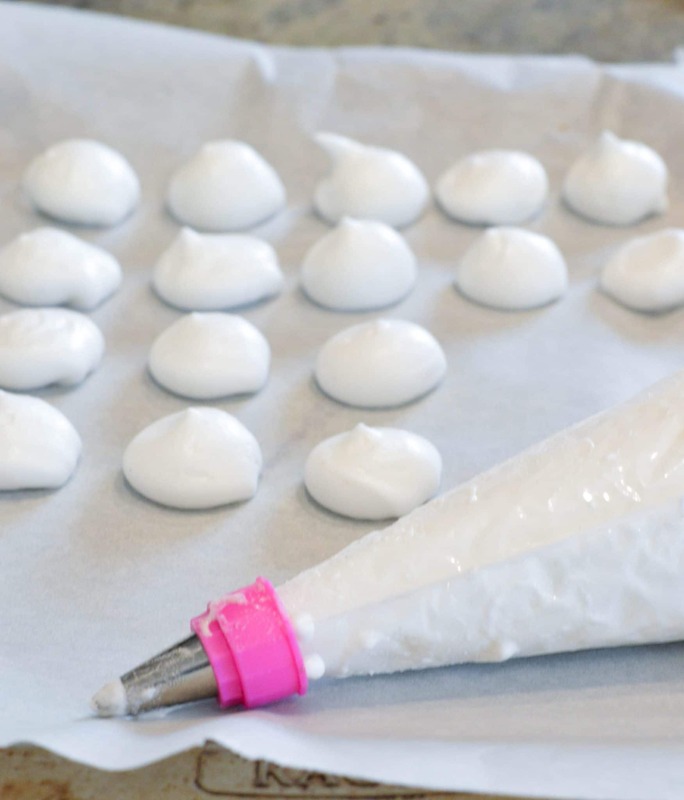 I know that many readers did this egg free meringue recipe using sugar and struggle a bit. As I am not using sugar your comment is absolutely wonderful to help others! Many thanks! oh and I love the meringue dip idea too. I will definitely try this ! Sounds divine. See you on the blog soon. Carine. If you are not using sugar, what are you using in its place? The recipe calls for sugar. The cookies look great! You can easily make the recipe using crystal erythritol a 100% sugar free sweetener but the texture will be softer. If you are on sugar free, I recommend using white eggs and erythritol for a crispy meringue. Enjoy, XOXO Carine. Hello can i use xylit instead of the white sugar? Hi Sabrina, I am not sure they will be as crunchy, specially without the egg white. I never try aquafaba with xylitol, let me know if you do, I am curious to hear how it goes 🙂 XOXO Carine. Hi Sabrina, I am not sure they will be as crunchy, specially without the egg white. I never try aquafaba with xylitol, let me know if you do, I am curious to hea how it goes 🙂 XOXO Carine. 120 C is closer to 250 F, not 200, which do you actually use? Yes true sorry for that I bake in Celsius so it is 120C (250F). Thanks for corecting me I will update the recipe post right now. Enjoy the low carb recipes on the blog. XOXO Carine.